The trial of the 25-year-old just cleared of murder charges was this generation’s OJ drama. Only this time, the regular market of questionably tasteless T-shirts and tchotchkes was flooded with apps, tweets, streams, and SMS alert services. If you’ve turned on a TV or radio or fired up the Internet in the last few months, you know Casey Anthony is the 25-year-old woman accused of cleared of murdering her 2-year-old daughter Caylee in Orlando in 2008. What you might not know is that the circus that’s sprung up around her trial has become more lurid than the details coming out of the courtroom. The glut of Caylee- and Casey-related merchandise has made for the kind of pop-up business that could only be powered by the web, smartphones, and social media. Since the trial began, CafePress.com users have created a bevy of wares featuring angelic photos of Caylee; you can pick up T-shirts ($23-$27), Sigg water bottles emblazoned with the tot’s image ($24), a shot glass ($12), or even a baby onesie ($15.50). There are plenty more shirts to choose from, too, including those emblazoned with quotes from the case that only diehard “fans” would be familiar with like, “You have also attempted to put electronic leashes on files, have you not, sir?” ($26). 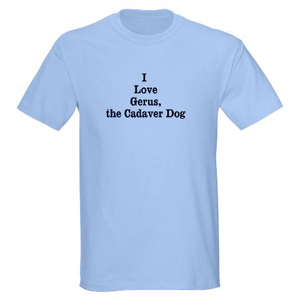 Or show your love for Gerus the cadaver dog that found Caylee’s body ($23), without whom you’d be stuck watching the simulated version of these events on Law & Order SVU. “Free Weezy” tees, these are not. To be fair, this has been going on for a while with the Anthony trial. In 2009, a company named Showbiz Promotions offered a so-called “tribute doll” (reportedly $29.99) named after Caylee that played “You Are My Sunshine,” as per a video of the young girl released during the trial. The doll, which looked nothing like the child, is no longer for sale and the website is in limbo. A Casey Anthony voodoo doll (bids starting at $19.99 and $29.99) was briefly for sale on eBay, as well as a grotesque “Zanny ‘the Nanny&apos;” puppet that the seller suggested would be “The Best Baby Shower Gag Gift-Resume Included!” Naturally, there’s also a mass-market paperback about the trial so far, even though jurors are only just now deliberating. But it’s Net-ready smartphones and social media that have really taken this trial beyond kitsch and into the digital era. You could stream the proceedings live from the Orlando Sentinel website, get Twitter updates, and have breaking news sent to you via text message. 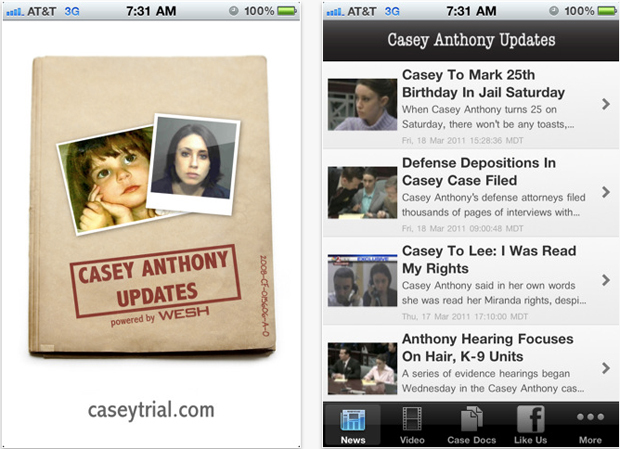 Perhaps the techiest twist was a new iPhone app ($.99) from Hearst Television that gave you access to the latest news through Orlando station WESH’s live blog, let you check out video reports on the go, read court docs while you’re waiting in line at Blimpie, or even send questions to WESH’s “legal analyst.” Reviewers were disappointed that there was no live feed of the proceedings available through the app. WESH did have a whole TV channel for that. Luckily, there was an iPhone app with live streaming from Progressive Lifestyles that went for $.99. At the time of publication, it was one of the top 100 paid apps in the iPhone store. There are many Jenni Millers in the world, but this Jenni Miller is a freelance writer based in New York City, as are numerous others. She has written about film, feminism, music, and various pop culture concerns for BUST, AV Club, Salon, Moviefone, Refinery29, The Cut, GQ.com, Vulture, and an assortment of other outlets online and in print.